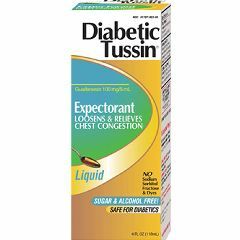 Diabetic Tussin Expectorant Liquid Diabetic Tussin EX 100 mg / 5 mL 4 oz. Sugar restricted diet: Diabetic Tussin is 100% free from sugar, alcohol, honey, fructose, sorbitol, or glycerin. Sodium restricted diet: Diabetic Tussin is 100% free from sodium. Diabetic Tussin is also 100% free from narcotics, decongestants, and dyes. Consult your doctor or pharmacist before using this product or any other medication. This Diabetic Tussin product does not contain any medication to improve or relieve any existing condition other than lack of expectoration. by Lewis from Slidell, La.